Size: 80 cm in length from the beak to the tip of the tail. Body deep red, shoulders and wings yellow. Primaries and tail coverts blue, greater wing coverts and shoulder coverts yellow, undersides of wings red-brown. Lower back and rump light blue. Cheek region bare and white with red feather lines. Eyes yellow, upper mandible pale with black at base, lower mandible and legs charcoal. Female smaller with shorter, broader beak. Oranges, bananas, sunflower seeds, nuts, berries, carrots, calcium (cuttlefish bone), bread, tomatoes, fresh twigs, fresh corn on the cob. Scarlet Macaw needs fresh branches for occupation. 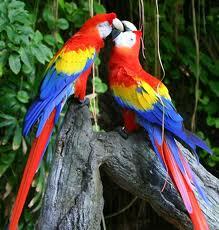 Macaws are large birds, and should be provided with ample space and time to play and stretch their muscles. They should be allowed outside of their cages for a minimum of 2 hours a day, and should also be given plenty of chew toys to help them exercise their powerful beaks and jaws. Sociable bird, usually monogamous in pairs, affectionate towards keeper. Can be noisy, especially when frustrated or bored, screeches. Loves to bathe, slaps water onto itself with its wings. Roomy aviary, parrot stands. Large nest box 60 X 60 X 65 cm all year, also for roosting. Lays 2 to 4 eggs, incubation 26 days, only by female, male sits at her side, fledging 90 days, chicks remain with parents for some time after.